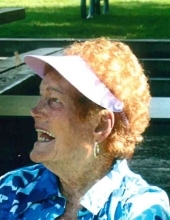 June D. Schrupp passed away March 12, 2019 at the age of 98 in Bozeman, MT. June was born in Lewistown, MT on June 19, 1920 to George W. Smith and Iva E. Barry and was raised in Gilt Edge, MT on a ranch. She married Dana O. Schrupp on August 24, 1946 in Helena, MT. They were married for 68 years and had three children: Colleen, Dave and Tom. June worked as a secretary and stenographer in Lewistown, Helena, Glasgow and Bozeman, MT. During WWII she worked in Seattle, WA. June was an avid sports fan, especially in support of all family athletic endeavors and, of course, her Bobcats. She will be remembered most for her love of family and friends. She was preceded in death by her husband Dana, parents, brothers Sonny Smith and Woody Smith and her sister Fern McEvony. She is survived by her children: Colleen (Frank) Proffitt of Bozeman, Dave (Joanne Dunne) Schrupp of Bozeman and Tom (Ann) Schrupp of Gillette, WY; her grandchildren: Kimmie Schrupp, Amy (Kevin) Ross, Tracy Spelts, Holly (Andy) Sanders, Charles (Julie Ellenberger) Schrupp, Maryann (Troy) Walters, Michael Schrupp, Jim (Jen) Huntzicker, Joe Huntzicker and Meredith (Sean) Childress-Reyes; and her great-grandchildren: Ainslie and Taylor Ross, Joelie Spelts, Andrew, David and Luke Sanders, Amelia and Violet Schrupp, Daniel Dion, Liam and Claire Huntzicker, Emily and Kimberly Childress, and Hudson and Carson Reyes. The family thanks the personnel of Bozeman Lodge, Hospice of Bozeman Health, the Advocare team and the Spring Creek Inn for their constant loving care of our mother. In lieu of flowers, memorials may be made in June’s name to Hospice of Bozeman Health, address through Bozeman Health Foundation, 931 Highland Blvd., Ste. 3200, Bozeman, MT 59715. A Funeral Mass will be held March 25th at 11AM at Holy Rosary Catholic Church, followed by a luncheon and Graveside Service at Sunset Hills Cemetery. To send flowers or a remembrance gift to the family of June D. Schrupp, please visit our Tribute Store. Funeral Mass, followed by a luncheon and Graveside Service at Sunset Hills Cemetery. "Email Address" would like to share the life celebration of June D. Schrupp. Click on the "link" to go to share a favorite memory or leave a condolence message for the family.